The Breakdown: What Will Student Loan Reform Do? Largely overshadowed by Healthcare's passage, student loan reform promises big changes to the current bank-based lending system. 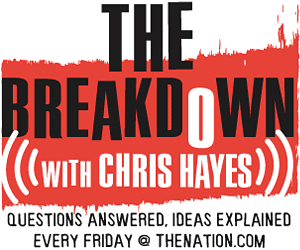 This week, The Breakdown with Christopher Hayes and education Policy Analyst Ben Miller, dissect these changes and explain how they will effect college students, past, present and future. The recent passage of the healthcare bill brought about a number of unprecedented reforms, but perhaps one of the most important changes the bill made had little to do with healthcare at all. Largely overshadowed by the blockbuster provisions and politics of the healthcare package, the transformation of student loan practices from a bank-based system to direct government lending represents a drastic shift in how students will finance their education. To explain the changes and how they will affect students, past, present and future, education-sector policy analyst and student-loan expert Ben Miller joins DC editor Christopher Hayes on The Breakdown. The income-based repayment calculator and information mentioned in the podcast can be found here. The New York Times provides an overview of the student loan legislation.